Snapfuze is the only locally owned and operated Photo Booth company that offers a print for each of your guests, professional Photo Lab Quality prints in less than 30 seconds, complimentary photo strip sleeves, and a money back satisfaction guarantee that ensures you’ll be happy with our service, or you won’t pay. Book either the Snapfuze Curtain Style Photo Booth or our new Open-Air Photo Booth, and a prop box and free delivery (within 60 miles of Ann Arbor, Michigan) are automatically included at no additional charge. We’ve included the prop box in all of our packages because we’ve found that with them, events are much more fun. If you choose to add a photo guestbook, your attendant will glue a printed strip from each session into your memories book so that your guests can write a message to you next to their photo. We’ll present the memories book to you at the end of the event as a keepsake so you can remember your guests while reading their well wishes. 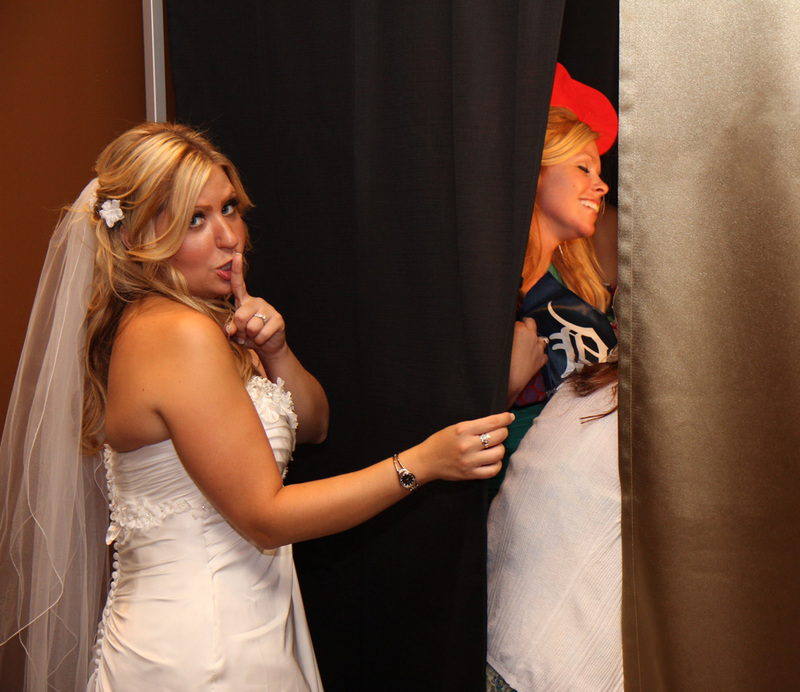 Snapfuze Photo Booths also allow your guests to select color or black & white photos during each booth session. You’ll never have to worry about being forced to choose either black and white or color for all photos taken during the event. We think it’s much more fun that your guests get to choose each time they enter the booth. However, if you’re feeling nostalgic, or just prefer color photos to Black & White we can set the booth to only take one or the other. In addition to having an unlimited number of photo booth sessions during your rental, we also offer a photo print for each of your guests that requests one. Once the Photo Booth session is complete the first two prints will emerge in 30 seconds, reprints in only 10 seconds more. We can print this fast, because we use professional quality dye sub printers (the same printers used by convenience stores for 1 hour photo printing). The printer is the most important link in the photo booth chain. If the printer is slow your guests will be forced to wait longer in line and won’t get as much time to use the photo booth. Your guest’s photo booth print will be ready quickly, printed with your custom designed logo, and the ink won’t smudge or run, or fade. We suggest asking whatever Photo Booth company you decide to go with if they use inkjet printers or dye sub to make sure you’re aware of the print quality you’ll receive. The one benefit to having an inkjet printer is that you can print larger strips such as 2″ x 7″. We determined that going with a Dye Sub printer was the best route for us becuase it allows us to offer fast, high quality prints that are rated to last for 30 years. After mentioning so much detail about our Photo Booths, we haven’t left much room to touch upon our DJ Services, so we’ll speak quickly about our DJs and touch on them more in another blog. Our DJs DJ C4 & DJ Graffiti each have over 15 years of experience with private events (wedding, birthday parties, graduation, bar & bat mitzfahs), but are also professional DJs that perform at other events such as clubs and concerts worldwide. Snapfuze DJs: Why are they the best in Michigan? When you book a Snapfuze DJ you’ll not only get a highly capable professional DJ who’s experienced, timely and appropriately dressed, but he or she will also know how to rock a party! Most of our clients hire Snapfuze DJs because they don’t want to have to choose between professionalism and getting a “real” DJ. With Snapfuze you can finally have both! Check out our affordable price packages, and if you have additional questions about full featured Photo Booth or DJ Services at affordable prices in the Metro-Detroit area email martin@snapfuze.com or call us today at 1-877-767-FUZE.